There are two football teams who play on the football pitch alongside The Clubroom. The teams have their own changing rooms separate from the hall. The Frilsham & Yattendon Football Club plays on a Saturday afternoon. Unfortunately very few of the players are now from Frilsham or Yattendon but despite this there is a strong local following. In the 2017/18 season they played in The Thames Valley Premier League - Division 1. Unfortunately the previous season's success was not with the team and they finished at the bottom of the league. They also play in a number of cups which usually attract quite a crowd of supporters. Team colours are red and black. If you want to come along and watch, league matches start at 2:30 and cup matches at 3:00 - check the league website to see when they are at home and follow how they are doing! 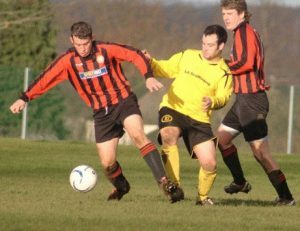 They play on Sunday mornings and, following a very successful previous season, they joined a new league - the Reading & District Sunday League - Division 3. They have struggled to win matches and finished the season towards the bottom of their new leahgue and division. Come along at 10:30 on Sundays - check the league website to see when they are playing at home and follow their progress.